In 1961, the Freedom Riders, a brave group of men and women, black and white, young and old, boarded buses, trains and planes headed for the deep South to test the 1960 Supreme Court ruling outlawing segregation in all interstate public facilities. They found violence in Alabama and were jailed in Jackson, Mississippi. Read their story. 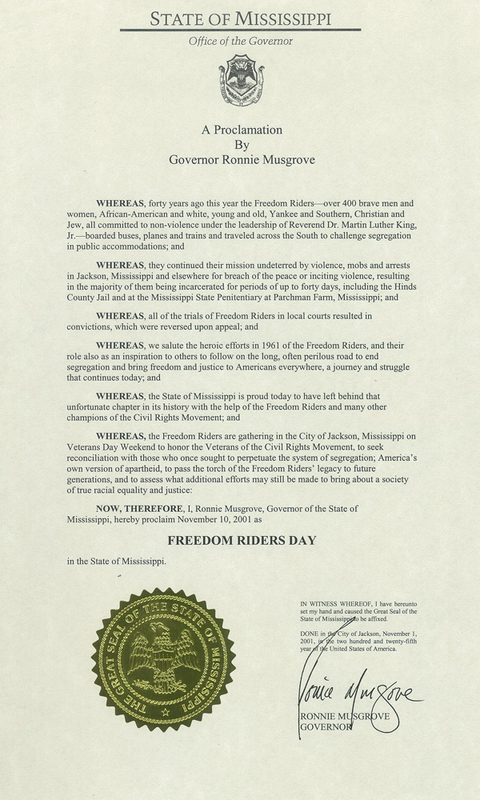 The 1961 Freedom Riders 40th Reunion will be held on Veteran's Day Weekend, November 8th-11th, 2001, in Jackson, Mississippi. For Freedom Riders, their families, friends and supporters. See particularly the Proclamation by the then-Governor of Mississippi, Ronnie Musgrove, issued at the request of the 40th Anniversary Reunion Committee, based on a text prepared by the Chair of the Reunion, Carol Ruth Silver. 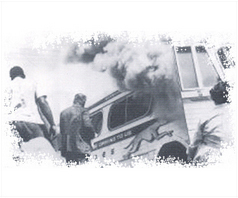 Contributions made on this web site are tax deductible and will be used for the 50th Anniversary Reunion of the Freedom Riders in 2011, and beyond, to honor the deeds and the memory of the Freedom Riders. For the 2011 commemoration of the 50 years since the 1961 Freedom Rides, there are numerous web sites, blogs, videos, events, and activities. See, for example, the PBS Special airing 16 May 2011, www.pbs.org/wgbh/americanexperience/freedomriders/‎ and the 2011 Jackson, Mississippi and Chicago gatherings of the Freedom Riders, http://1961freedomriders.org/ and http://freedomriders50th.com/.